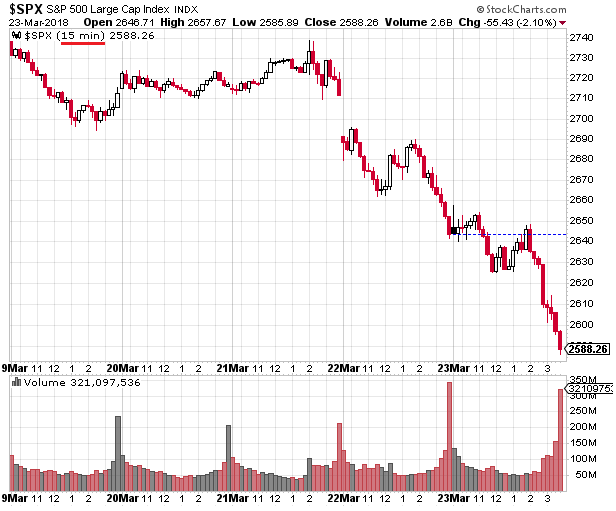 This past week was certainly a difficult one for the market and by default, a difficult one for investors. Most of the weakness occurred on the last two days of the week, which resulted in the week's return for the S&P 500 Index ending at a negative 5.98%. Before passage of The Tax Cuts and Jobs Act in December, earnings growth for the S&P 500 was expected to be low double digits in calendar year 2018. Since passage of tax reform, a significant improvement in earnings growth expectations has occurred. 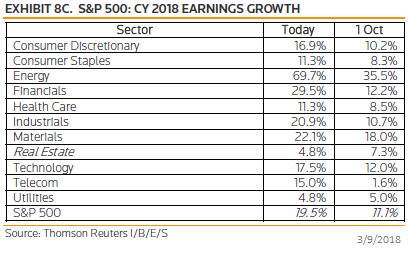 The below table shows I/B/E/S earnings growth expectations in October by sector and for the S&P 500 Index compared to expectations as of the end of last week. 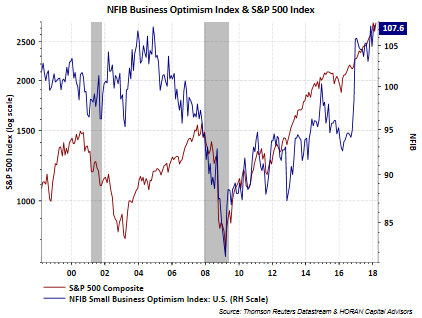 Today the National Federation of Independent Business (NFIB) reported small businesses are showing unprecedented optimism. The NFIB Small Business Optimism Index was reported at 107.6, the second highest reading in the 45-year history of the Index. The highest reading recorded was 108.0 in 1983. A little over a year ago I noted the yield on the 10-year Treasury surpassed the dividend yield of the S&P 500 Index. With rising bond yields, there becomes a point when the bond yield is sufficiently high relative to the yield on stocks that bonds can challenge stock returns. In that earlier article I referenced a research article written by CFRA Research's Sam Stovall and titled, Rising Prices, Shrinking Yields. In the research article it was noted prospective stock returns became most challenged when the yield on the 10-year U.S. Treasury exceeded the dividend yield of the S&P 500 Index by at least one full percentage point, i.e. 100 basis points. The forward return at varying spreads is detailed below. 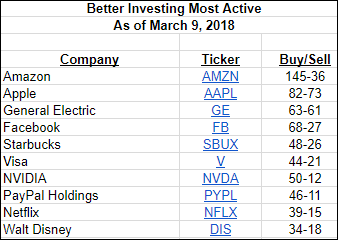 Periodically I review the most active stocks individual members of Better Investing indicate they are purchasing. A notable feature on the current list is the fact technology related stocks are dominating member purchases. 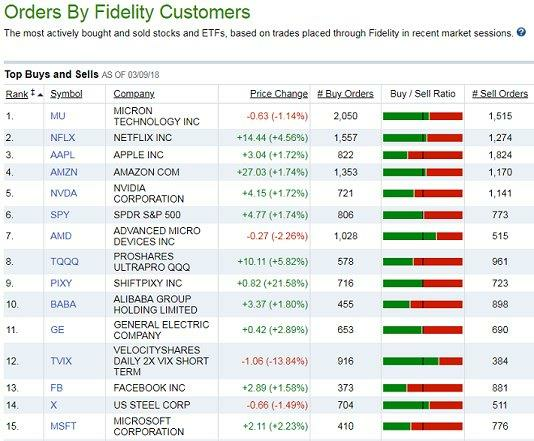 Additionally, after the market's close on Friday, I posted a tweet noting Fidelity customers' top purchases. Again, technology stocks are gaining the interest of Fidelity's individual investors. With both the technology sector SPDR (XLK) and the Nasdaq Index both achieving record highs on Friday, one might believe the technology sector is getting over heated. The interest in technology has led to acronyms for various groups of stocks, with the most familiar being the FAANGs, representing Facebook (FB), Amazon (AMZN), Apple (AAPL), Netflix (NFLX) and Google (GOOGL), now known as Alphabet. 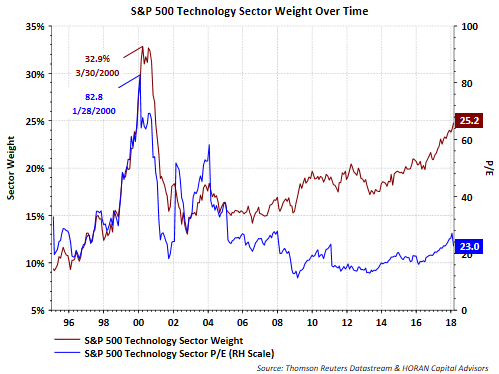 As the below chart shows, the technology sector in the S&P 500 Index accounts for 25.2% of the index weighting and is approaching the technology bubble peak of 32.9%. One major difference today though is the fact the valuation of the technology sector holdings is not even close to the bubble peak valuation. At the height of the technology bubble in 2000, the technology sector P/E equaled 82 times trailing earnings. Today, the trailing technology sector P/E is 23 times earnings. In spite of the fact a few technology or technology related stocks trade at higher P/E multiples, the valuations are far from bubble levels seen in 2000. 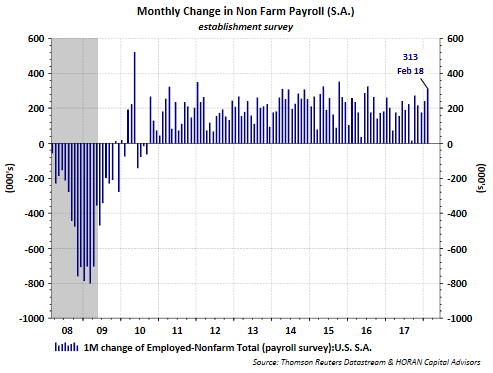 The headline number of an increase of 313,000 in February's non-farm payrolls this morning was big. This is the largest monthly increase since July 2016. The high end of consensus estimates was for a 230,000 increase in payrolls. December and January reports were also revised higher. President Donald Trump's announcement that he is instituting tariffs on imported steel and aluminum came as a surprise to some although reducing the trade deficit was one of his campaign promises. Dealing with the trade deficit issue is a complicated one since no one factor impacts trade. What is complicating a necessary discussion at the moment is the vitriol in which President Trump's tariff proposal is being discussed. For example, the media repeated commentary that the market would collapse once President Trump signed the tariff executive order; yet the S&P 500 Index closed almost .50% higher today. Since July 2016 the yield on the 10-year US Treasury Note has increased from 1.32% to nearly 3% today. This doubling of longer term interest rates is creating a headwind for dividend paying stocks resulting in their underperformance versus their non-dividend paying counterparts as well as the broader S&P 500 Index. The maroon line in the below chart represents the total return for the S&P 500 Index divided by the total return for the iShares Select Dividend ETF (DVY), When the maroon line is moving higher, the S&P 500 Index is outperforming the iShares Dividend ETF. Clearly the broader S&P 500 Index has been outperforming the dividend payers since July 2016. The blue line on the chart represents the yield on the 10-year U.S. Treasury Note and it is not a coincidence that the dividend payers are underperforming just as the 10-year Treasury yield began to rise in July of 2016. A colleague and I just returned from a week long trip in south Florida visiting some of our clients on both the east and west coast of the state. One notable factor was the very high level of activity everywhere we visited. Restaurants were all packed, road traffic was unbelievably jam packed and the number of semis on the road seemed higher than usual, and usually those trucks do not drive around empty. We visited a new golf course development and the activity was anything but recessionary like. The bottom line is sentiment is highly positive and supports recent economic data releases focused on sentiment and economic indicators.